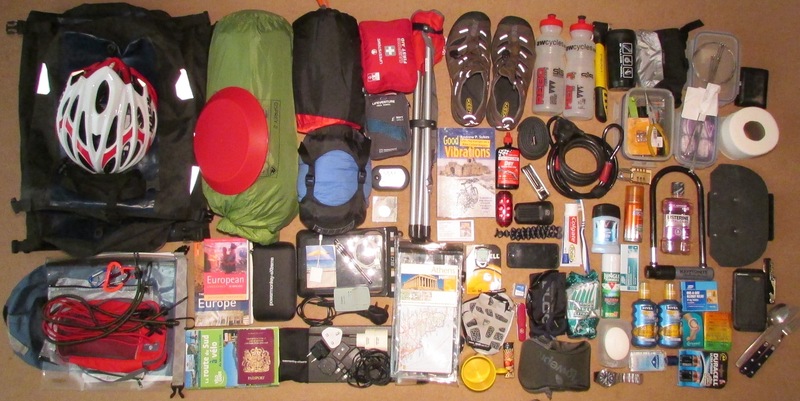 *These items travelled with Reggie & me in 2010 when we crossed Europe for the first time. …and here is a ‘behind-the-scenes’ version of the phone, feet included. Take- A – Look mirrors are fantastic.For the mouldy bottle problems check out Clean Bottle, so simple you wish you’d have thought of it. Words from an experienced long-distance cyclist re. : Kit. I have travelled very heavy and very light, and everything in-between. I much prefer a light kit on a heavy bicycle with fat, smooth tires. My 2012 trip was 10 months, 14,000 miles, in weather that included freezing temperatures, snow, rain, desert dry heat, and tropical heat with humidity. I camped about half the time. billyromp.com contains a list of my equipment. 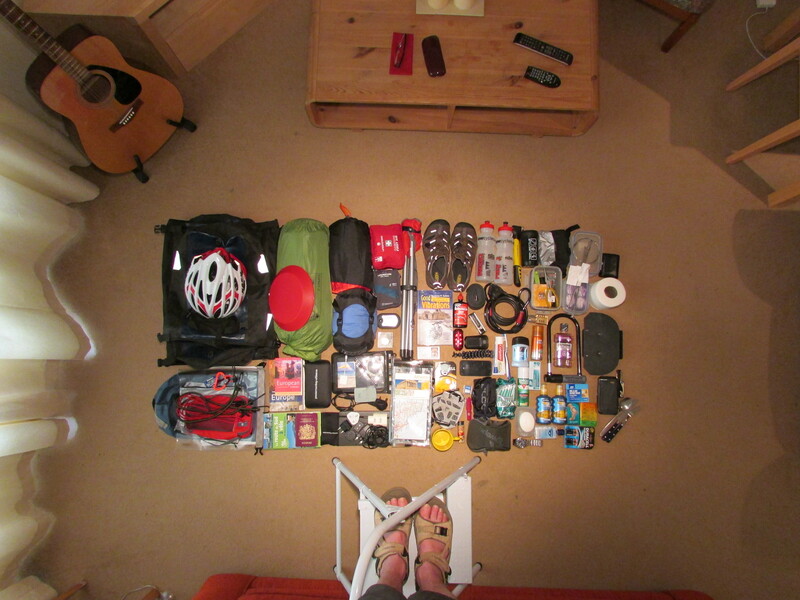 After forty years of bicycle touring I feel I have a highly developed kit. 2) I choose to ride without a helmet; I use a wool cycling cap in cold weather, a cotton one in warm. 3) A plastic plate is very light but unreliable and single-purpose. I use a titanium Sierra cup, no heavier, more versatile. 4) I use a four-season mountaineering tent, single-wall, 1-2 man, Black Diamond brand, 3.5 pounds. More than 4 pounds is excessive. 5) A two-pound goose down bag (North Face Chrysalis) serves me well; it packs up very small. A goose-down hooded jacket, pants and booties, ultralight, from Western Mountaineering, extends the bag’s usefulness in cold weather. Rule of thumb: if I am not wearing everything to bed on the coldest night of the trip, I have carried too much clothing. 5b) Vango brand I am unfamiliar with. I see most bicyclists carrying way too much mattress. An ultra-light Thermarest has served me well for decades; it rolls down to the size of a water bottle and weighs a few ounces. 6) I make up my own first aid kit, according to my planned exposure and my own first aid skills. Wound care, basically. 7) I use a wash cloth; a towel is a luxury. 8) A single keychain LED light is enough. A spare one is in the survival kit. 9) A camping stool? Unless you have a physical limitation, a heavy luxury. 10) I wear mountain bike racing shoes, SPD. “Touring shoes” and sandals break down quickly by comparison. 11) I read books on my iPhone these days. 12) Business cards are a good investment and worth carrying. 13) Finish Line Dry has limited application, no rain protection. I’m not particular, but it has to be heavier than that. 14) Multi-function tools vary a lot, and most are overly heavy. I carry a tiny pocket Swiss Army knife to supplement the Opinel knife in the cook kit. 15) Rechargeable and battery front lights are heavy for their output and unreliable compared to a generator with a powerful light. I prefer battery-powered rear lights; they are more reliable than a long wire from the front to the back. Spare batteries are not needed; I carry a spare rear light, a tiny button-battery unit, the size of a wrist watch, that mounts on the seat post or anywhere. 16) I am not a photography enthusiast, so I save weight by bringing no camera, case, tripod, batteries, recharger. 17) I’m a believer in good solid water bottles. 18) I do not use a lock. While occasionally one would be convenient, it is hardly necessary. In the most dangerous campsites I tie a black cord to the bike, lead it into the tent and tie it to my sleeping bag. At hotels, hostels and at hosts’ homes I bring the bike inside, try hard to bring it to my room, and trust the front desk when I can not. So far so good. 19) There are lighter pumps, good ones. Mine is Topeak brand, tiny, only a few ounces. 20) Three water bottle cages are sometimes not enough for water. I would not use one for tools. 21) I go a little heavy on tools. A needle-nosed Vise-Grip is good. So is a toothbrush. I like to have a couple of cone wrenches and some BB tools. I carry two tubes and a patch kit (with a razor blade, wire, and money in it). I did not notice a patch kit on your list. 22) Soap powder; for laundry? Available where laundry machines are; not recommended for rivers and streams. 23) Wallet, of course, for the contents. A zip-lock bag suffices. 24) Better make that two spare cables, one brake and one derailleur. Spare spokes definitely; I put mine in the seat post with a cork. 25) Toothpaste I like. Deodorant creates a situation where eventually you will smell worse as the bacteria change to deodorant-resistant. Wear wool, which has natural antibacterial properties and fights odor. In warm weather I wash (rinse) clothing and body daily. 26) Shaving gel–in a can? Heavy. Bar soap (which I have anyway) and a brush (super-light weight) do the trick. 28) Mouthwash–like deodorant–you’re better off without it. Good brushing, the occasional mint or chewing gum. 29) I have stopped using maps since I carry an iPhone. When I did use maps, I kept them in the pack and referred to them only when necessary, usually in town. I find a mounted map distracting. Same for iPhone: I carry it in the handlebar bag, not on a mount, and refer to it as necessary. 30) Waterproof bags, good. Bungee cords, bad. They are poor attachment devices on a bicycle, and can be dangerous. Perlon cord will serve you much better. 31) You carry an iPhone. Why all the paper books? The books and information in there (and in the leaflets and other printed stuff) is available for download. 33) iPad mini AND iPhone? If you are an enthusiast, maybe, but it seems like a lot for a bicycle trip. 34) The camera is a good, small model, but with it’s charger, batteries, adaptors, cards and their care and storage, I leave mine home. The iPhone has a decent camera. 35) You have a notebook in addition to the phone and iPad? I created and wrote my blog on my phone, using voice-memos and learning to type fast on it. 36) I don’t use a cyclocomputer any more, but I used to, and I understand the appeal. I don’t miss mine. 37) Years ago I gave up bicycle gloves. One less item to keep track of. This requires that I set the bike up more precisely to control the weight on my hands, and better set-up is a good thing. I carry leather dress gloves (with the lining removed), light wool liners, lighter polypropylene liners, and waterproof over-mitts, which covers a range of conditions. 38) A plastic mug. Again I choose a titanium mug. Plastic cracks, melts, burns, and stains. 39) I hope your Swiss Army knife is a tiny one. 40) Razors, OK. Insect repellant is largely ineffective, smelly and hard to clean off, soils the clothing, and is often toxic. I carry a mosquito head net;. Same for sun block; I use a hat. In the desert, a band-aid on my nose and tops of my ears. 41) The pharmaceuticals are your choice, but I have found little use for them over the years. I have learned to approach health from a pro-active, preventative approach, and healing from a food-and-local-remedy perspective. 42) The phone mount I have mentioned above. With no map, cyclometer or phone on the dashboard, attention is focussed outward for navigation information, which places a person more definitely in the landscape and increases skill and ability. With a cyclocomputer, one never really learns to estimate distances properly. 43) Bottles can be opened with almost anything, including the bottle openers on your multi-tool and Swiss Army knife. 44) A knife, of course, and a spoon. A fork is redundant. If you can’t get it with a spoon, and you can’t get it with a knife, a fork is not going to help. As for clothing, I favor merino wool shorts, tights, jerseys and socks for most weather. Merino wool can be aired out overnight and smell good; polypro and most synthetics are very hard to keep fresh. In the heat, lycra shorts and jerseys, rinsed daily. A Gore-Tex bicycle suit is nearly always enough, but I carry an extra ultra-light hooded Gore-Tex shell for extreme weather (it will go over my goose-down jacket, which my bicycle suit will not). On a long trip I carry no other, off-the-bike clothing. What for? In the last forty years I have very rarely wished I had some civilian clothing along. I feel fine at any gathering in bike clothing and shoes. You did not mention cook kit. I use a minimalist alcohol stove, kettle, Sierra cup, 12-oz. bowl, and spoon, all titanium; aluminum foil a windscreen; and two 8-oz. Nalgene bottles for alcohol. I carry 1-oz. Nalgene bottles for salt, pepper, garlic powder, 8-oz. for olive oil. That’s it. Usually I use it only for dinner. My entire kit is 48 pounds with water and fuel, without groceries. Everything goes in the panniers; I do not stack the rear rack. On this last trip I took my mandolin in its hard-shell case and five harmonicas, an extra nine pounds, purely an indulgence. I have met cyclotourists with twice as much weight as I was carrying, doing much more work and camping in no more comfort than I was. I often wonder what is in those stacks of stuff (poorly attached with bungee cords) that I see people carrying on the rear rack, and I wonder what good it does them. The world is not flat, mostly. I have toured with less, and put up with the lack when it arose, very happily. I hope you have found my comments useful. P.S. Please call me Andrew! Well I’ll give them a good wash before we set off. Any other reasons I should be aware of…? My bottle seem to go mouldy and slimy if I don’t clean them out every day. I usually start off with good intentions but then it keep putting it off. Commuting across London picking up the crap in the air and on the road probably doesn’t help much either. I’m pleased to read your list – thanks. Are you maybe duplicating some things? I use Powertraveller stuff – you can recharge AA/AAA batteries, charge most anything, not use other adapters and I’ve used then across Europe so avoids adapters. I also take zipseal bags a lot, parachute cord, tarp and a mass of cable ties. Ortlieb waterproof bags of all sizes – also 4L waterbag which attaches really well sideways on top of panniers. I see a lot of touring bikers using mirrors attached to the handle bars or like those: http://www.amazon.com/Bike-Peddler-Cycling-Eyeglass-Mirror/dp/B001VTQNVO (attached to sunglasses or helmet). Do you have any opinion on them? Have you ever tried using one? I need to catch up with your travels Chris. Where are you tonight? Assume your messing about over the TV milarky. Off topic, but everytime I press a link from Twitter to this site it immediately takes me to the map with your next route on. I have to reselect FB in order to get back on to your site.